I am satisfied with both price and quality. 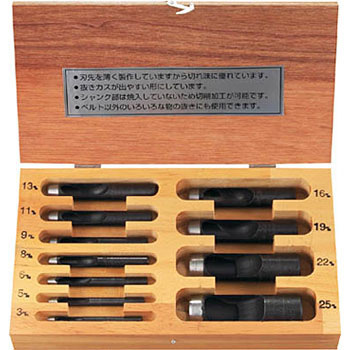 There are various sizes, very useful. This review is about item#37309194. I bought it for perforation of silicon sheet. Since multiple sizes are set, it is convenient to correspond to things that differ in finished size depending on the material, such as rubber sheet. I think that the usability and price are good, but I wanted a big size that is not in this set, so I bought it separately. Besides the five sets, there were plenty of kinds of 7 to 8 sets, 10 sets etc ... Also thinking about the storage later, I wish I had it. I used it for drilling a rubber plate, but I can not do it at all. I tried variously how to use it, but obediently there is no hole. At the end I pierced the hole with pliers. It is only possible to cut a quarter of the circumference. I am satisfied with breaking well. This price is cheap as the required size becomes a set! I am satisfied with breaking well. I think that it is a product finished to a slightly larger cutting edge angle suitable for hard work. It seems to be a bit sharper for this application. It is a product with good cost performance, but it is 4 points. Is it normal that it is more sharp blade? I guess this is better for clipping skins. This review is about item#37309185. The blade was cut well and it was easy to drill.